Land based casino around the world are facing many challenges, one of which is engaging with modern gamblers. Many casinos are hoping to innovate their offerings to try and capture a younger audience. Two land based casinos, the Monte Carlo in the US and the Ritz Club in London are proactively trying to tackle the modern market. They hope renovations can help them retain their market position in this new gambling environment. The Monte Carla Resort and Casino in Las Vegas is set to receive a renovation and some rebranding to become the new Park MGM. While the Monte Carlo has been very successful since its launch in 1996, MGM CEO Jim Murren said that they want to move away from casinos branded after other locations and rather wanted to make their casinos original. MGM have partnered with the Sydell Group to manage the renovation project, as they are the team who also works with NoMad casinos, who will be taking over a second hotel connected to the new Park MGM. While the Park MGM is already slated to offer 2700 rooms in its hotel wing, the NoMad Las Vegas will feature a much smaller layout of 290 rooms. The rooms are already 90% complete according to Sydell with people actually already staying in the finished rooms. By next week the construction company should have all rooms renovated. MGM have purposely gone with a modern aesthetic as they believe that the younger generation of casino fans prefer a more modern look over the classical styling’s of the old Monte Carlo Casino. MGM’s next moves are to start renovations on their other two properties, the Luxor and the Excalibur but so far there are no plans to rebrand them as was done with the Monte Carlo. Over in the UK the Barclay brothers are taking into consideration the possibility of selling the Ritz Club. They will be working through Oakvale Capital who will be managing the sale on their behalf. The legendary gambling venue is reportedly worth around £200 million. The club has existed in the basement of the Ritz complex since about 1906. The venue has served various functions but only started offering gambling as a casino in 1977. 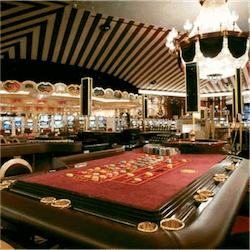 Due to its unique interior design and long storied history, the venue has always been a huge draw for high rollers. Back in 2011 the brothers had already been receiving multiple offers to purchase the venue. They received offers of up to £625 million.